Today after church I had one thing and one thing only on my to do list. The other things can wait, right? Yesterday when I mentioned my love for Williams-Sonoma’s peppermint bark, Molly, an awesome blog reader, emailed me with her recipe for the festive treat and I knew I had to take a crack at it today. Fortunately Molly’s recipe was really easy! *Note: I highly recommend using a block of good quality chocolate for this recipe (I used Baker’s brand baking blocks). Chocolate chips don’t work as well because they have stabilizers in them, and the layers in the bark tend to separate. Line a baking sheet (with raised edges) with foil, and spray with non-stick spray. Melt dark chocolate in microwave (30 second intervals on high, stirring in between). Add 1/2 tsp. of canola oil and spread evenly in pan. Refrigerate until solid. 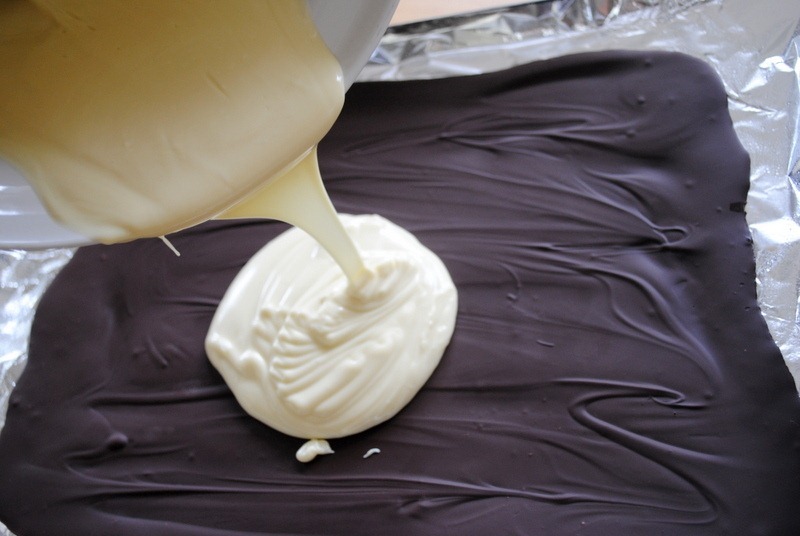 Melt white chocolate using the same method, and add 1/2 tsp. of oil, as well as the peppermint extract. Spread white chocolate mixture over dark chocolate layer (it is best to let the white chocolate cool a bit, so it doesn’t melt the dark chocolate and swirl layers together). Sprinkle crushed candy cane pieces on top, and refrigerate (or freeze) until solid. Remove from cookie sheet, peel off foil layer, and chop into pieces. Enjoy! 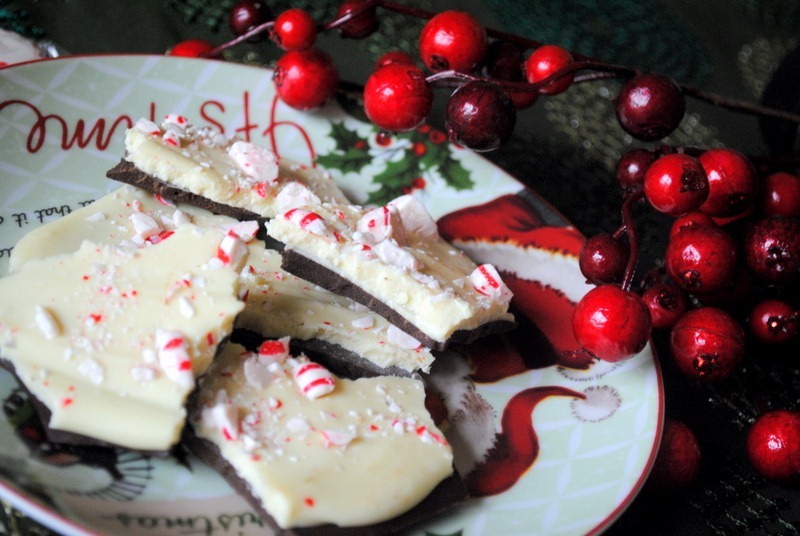 I have a feeling this peppermint bark will take the place of my holiday pretzel treats as my go-to homemade holiday sweet treat to give to friends. 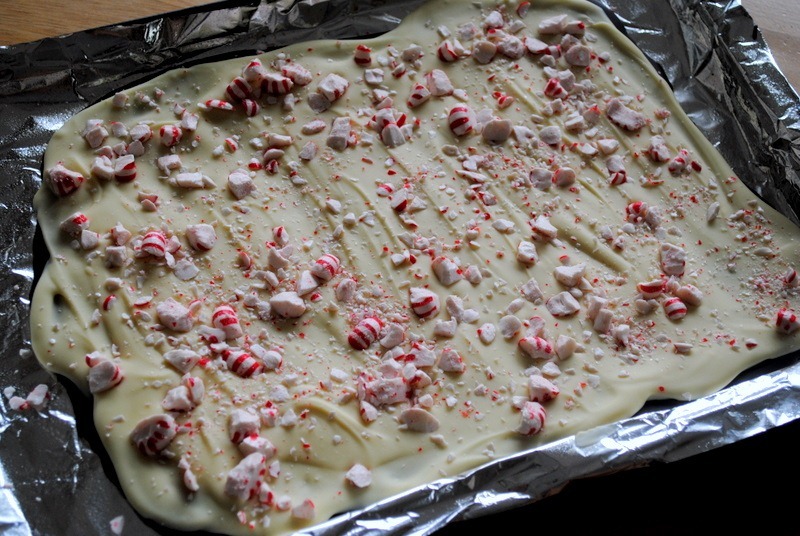 And I just realized something: This recipe makes two pounds of peppermint bark. There are currently two people in our house right now. I often back-read your blog and my goodness, I haven’t laughed so hard in ages! It was your You Spin Me Right Round post from September 09…..
Wow, that looks beyond fantastic! Sounds like an easy recipe. Thanks to Molly and you for sharing! I love the holidays and all of the great treats! 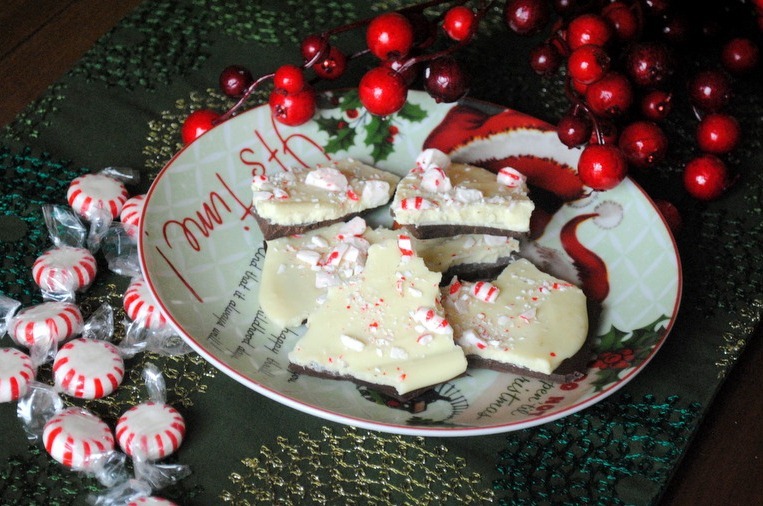 These look amazing….I definitely wouldn’t mind receiving that as a holiday treat!! Here are many images add and you can see these all eating bark that is the very nice and good and healthy for all pets. Looks just like store bought! Oh wow that looks so good. I love the super thick layer of white chocolate. I could never have that around the house! Wow this looks amazing! 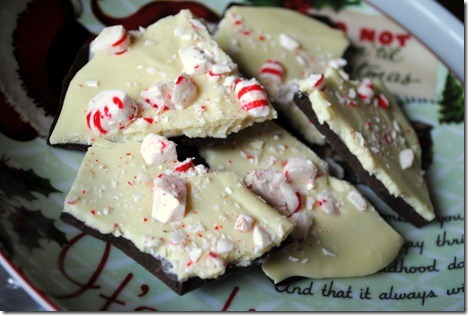 I just did a christmas survey on my blog and peppermint bark was my answer for my favorite christmas food. I’m going to a cookie swap in a couple weeks and I think I’ll be making this. It could count as a cookie right?? Even easier pepperment bark recipe, its always a hit and really peppermenty! 2. Prepare a cookie sheet by covering it with smooth aluminum foil. 3. 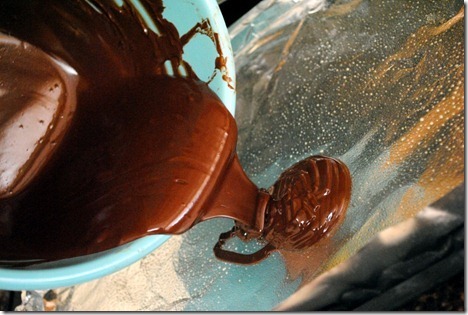 Melt or temper the dark chocolate. Pour the chocolate onto the prepared cookie sheet and use an offset spatula or knife to spread it to an even thickness, a little more than 1/8″ thick. The chocolate does not have to reach all sides of the sheet, as it will be broken up later anyhow. 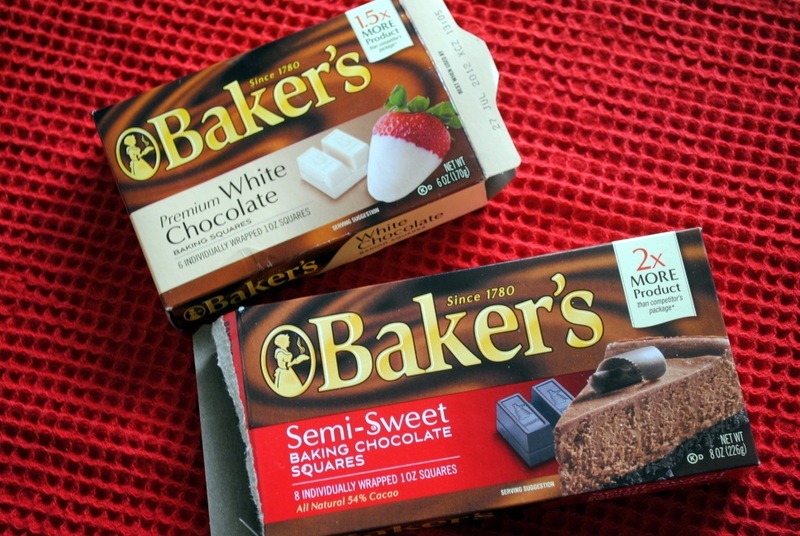 Place the tray in the refrigerator to firm up while you prepare the white chocolate. 4. 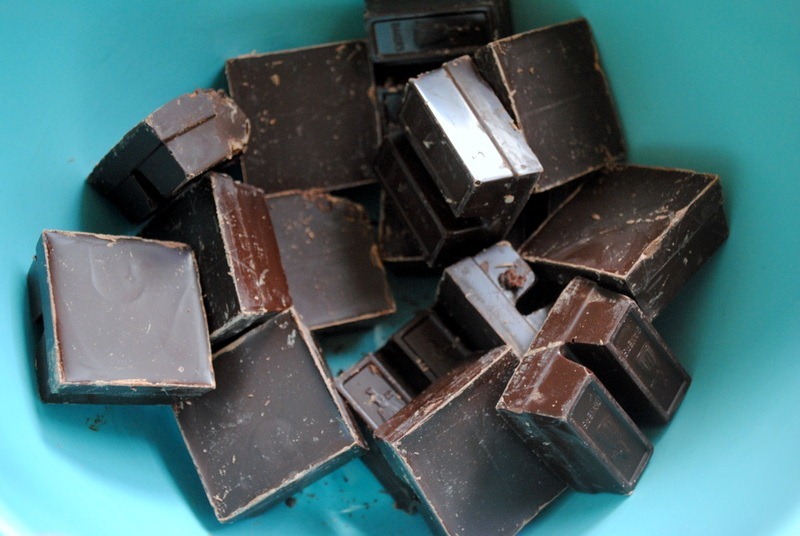 While the dark chocolate hardens, melt or temper the white chocolate. *Stir in the candy cane dust. 5. Remove the tray from the refrigerator and spread the white chocolate in an even layer over the dark chocolate. 6. 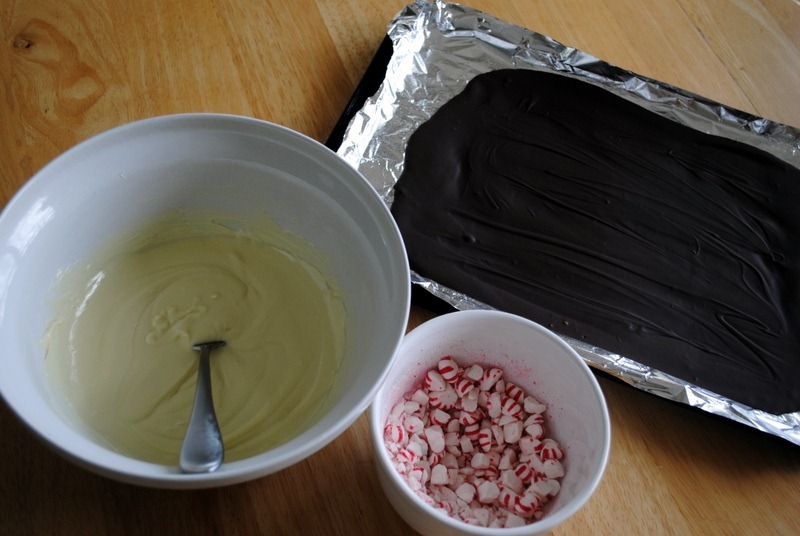 While the white chocolate is still wet, sprinkle the remaining candy cane pieces over the entire surface evenly. Press down very slightly to ensure they stick. Place the tray back in the refrigerator to firm up for 30 minutes. 7. Once the peppermint bark bark is completely set, break into small, uneven pieces by hand. Oh goodness gracious. I love peppermint bark. Looks like I am going to have to get all crafty in the kitchen sometime this week. By the way, I love the new “pin it” buttons! That dang site is so addicting! That looks so easy!! I think i’ll try this! 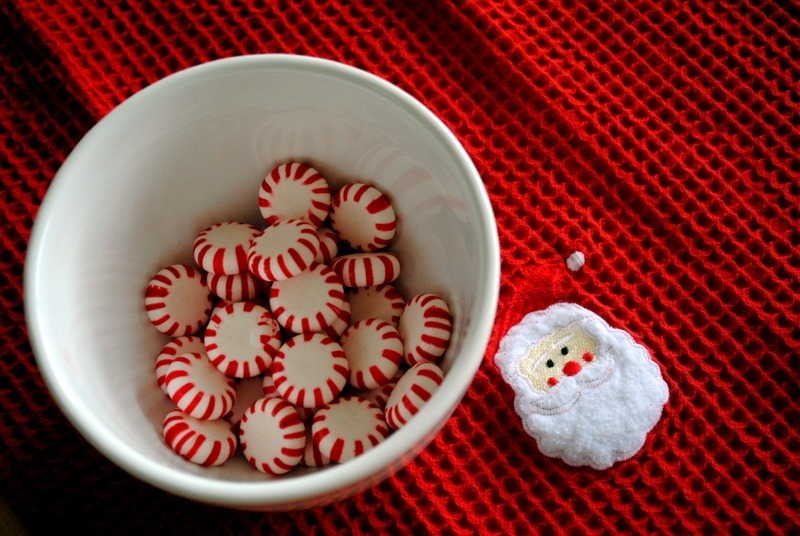 I’m not a big peppermint fan but these look delicious! Hope you’re enjoying them! Question about the pretzel treats! Do you know if they are able to be made in advance? How well do they store? If I make this and put them in a shaped silicon ice cube tray to harden…do you know if that would work/they would pop out okay?